The 13-3 battle between the New England Patriots and Los Angeles Rams was not the only clash at Sunday night’s (US time) SuperBowl. It was a battle between the publishers to see how many of their songs they could get onto the 60 ads screened during the three-hour game. The SuperBowl is the most expensive ad buy on American TV, with the CBS network getting between $5.1—$5.3 million for 30-seconds of airtime. Synchs for in-demand tunes can command anywhere from $100,000 to about $1 million on the publishing side. The figures are similar for the recording side if the original masters are used. Early ratings figures suggested the lowest in a decade, but the game still drew close to 100 million Americans catching it on TV and a couple of million more digitally. Sony/ATV was the most successful, with a share in eight national ads, BMG had eight. Warner/Chappell had at least four. Cardi B, who declined to perform at the half-time entertainment, starred alongside Steve Carell and Lil Jon in Pepsi’s More Than OK ad, which featured her chart-topping and Grammy-nominated ‘I Like It’ with Bad Bunny and J. Balvin. That ad was shared by Sony/ATV, Universal, BMG and Kobalt. Queen’s ‘Don’t Stop Me Now’ featured in Amazon’s Not Everything Makes The Cut commercial whose all-star cast included Harrison Ford and Forest Whitaker. The success of the British band’s Bohemian Rhapsody movie saw Sony/ATV licence their songs this year to brands including Google, Peloton and Silk Almondmilk. Michael Buble’s version of the 1920s standard ‘When You’re Smiling’ was licensed for a Pepsi ad starring the Canadian crooner. Ludacris appeared in a Mercedes-Benz commercial which included his 2003 #1 ‘Stand Up’. Bob Dylan’s power-political ‘60s anthem ‘Blowin’ In The Wind’ fitted in with beer brand Budweiser’s “Wind Never Felt Better” campaign. It showed a Dalmatian riding on a beer wagon pulled by Clydesdale horses, which turned out to be actually powered by electric windmills – to show that its beer is now brewed solely by renewable electricity from wind power. Dating and networking app Bumble used Rita Ora’s version of ‘Soul Survivor’ from last year’s Phoenix album with footage starring tennis legend Serena Williams. Other Sony/ATV songs used during the SuperBowl were Dean Martin’s 1953 hit ‘That’s Amore’ by T-Mobile and Foster The People’s ‘Sit Next To Me’ for Hyundai. Sony/ATV’s president of global chief marketing officer Brian Monaco said: “The Super Bowl stands out as the most coveted spot in the calendar for songwriters and artists who want their music associated with a platform that has over 100 million people watching on TV and millions more engaged digitally. “Thanks to the digital platforms, the game has become an even bigger story for brands. A Toyota spot featuring its brand-new sports Supra navigating a giant pinball machine marked the “exclusive commercial debut” of The Who’s “Pinball Wizard” and coincides with the 50th anniversary of the Tommy album. Also going symphonic was Amazon Alexa’s use of the London Symphony Orchestra’s version of the Umberto Tozzi and Laura Branigan’s disco hip shaker ‘Gloria’. 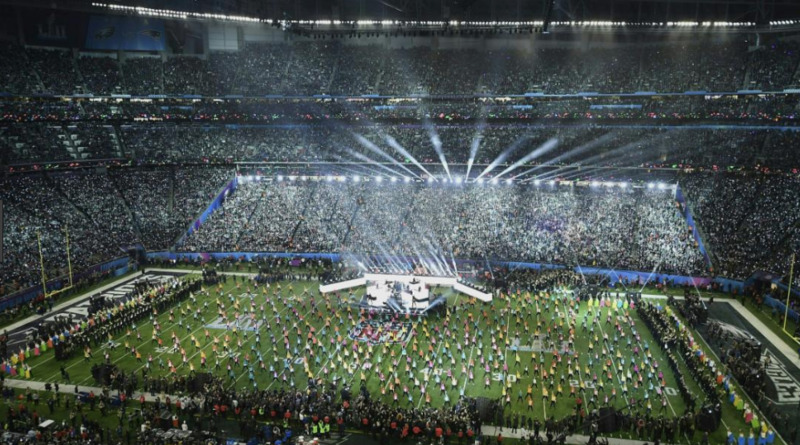 In other SuperBowl stats, Maroon 5’s halftime performance was deemed lacklustre. But their sales went up 434% (or 25,000 downloads) overnight, with similar spikes for their guests Travis Scott and OutKast’s Big Boi.